Cadfan, Constanza, Alda, and Carl vs. the Heavy Metal Dragon at the Cleveland Mini Maker Fair. Photograph by: Gaius Macro Calvinus. On Saturday, November 4th, fourteen members of the Barony of the Cleftlands participated in the Mini Maker Fair at the Cleveland Public Library. The event showcased the talents of makers from far and wide. 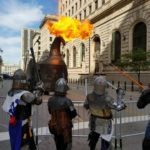 Exhibits included life-sized functioning models of Star Wars droids, a Tesla Coil orchestra, and a 30-foot long fire-breathing metal dragon. The SCA was given a large room where we displayed and demonstrated spinning, weaving, archery equipment, armor, swords, honey, and the process of turning flax into linen. Outside we gave combat demonstrations throughout the day, both armored and rapier. The event organizer stated at the end of the day that attendance was numbered in the thousands. Thank you to Eve of Cleftlands for organizing our role in the event and thank you to all who gave their time on a Saturday to educate the public about medieval life: Carl of Cleftlands, Cynwrig ap Llywelyn, Eryn Deoradhán, Jolicia atte Northclyfe, Nadyezhda the Simple, Gwyneth Cole, Robin of Cleftlands, Milesent Vibert, Aldermoureis Ventzke, Aurelia Rosetti, Gaius Macro Calvinus, Brendan O Corraidhe, Constanza de Mendoza, and Cadfan of Cleftlands.